It's been a perfect addition to our bedroom. It's lower than we're used to and I wish it had a stronger support beam in the middle (the existing one often gets off kilter). But a great value for the price. Displaying rich woodgrain in a variety of wire-brushed finishes, this queen platform bed is durably built in solid pine wood and designed to omit bulky box springs and foundations. Eco-friendly design with a modern lodge feel, this bed is an excellent addition to your home. 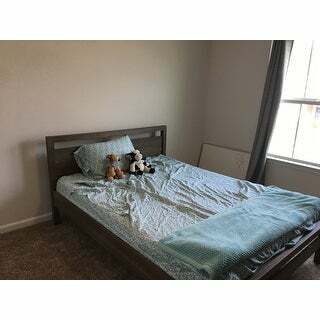 I have to admit I didn't really know what platform bed meant when I bought this, not realizing that you only use a mattress not a box spring in it. 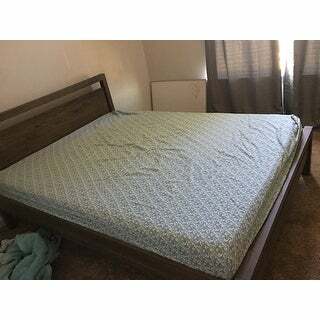 That was my fault, but I have a temperpedic bed and tried it just with the mattress and did not think it was that comfortable, so I put the box spring and mattress in and it is nice and comfortable. 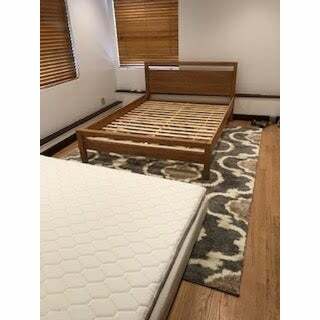 It is not the low profile because I did it this way, but if you need firm support, you will want a box spring, the wood slats and a mattress don't provide this. It is a great color and well made and looks really nice. We have dark purple and grey-blue bedding and this accents it well. 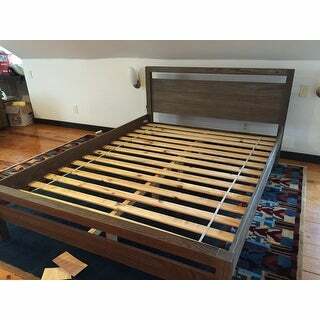 A really nice quality bed frame. Ordered the weathered look and the colors are a nice blend of blue gray/beige. Solidly made. Arrived in two well packed boxes and was relatively easy to assemble. There are quite a few screws to attach and no pre-drilled holes, so yes there were a few blisters as a result...perhaps pre-drilling starter holes would help the process. The headboard is short, so using a box spring and mattress would end up covering the headboard. But the bed is fully slatted...more screws to attach the slats to the base, but then all you need is the mattress. A queen mattress slips snugly into the frame...headboard, side boards and foot board keeping it all in place. All in all, I am very pleased with look and feel of this bed frame...solid quality and a fair price. The bed once assembled is nice, what I expected. Sturdy and cute for my small guest room. Comforters hang over the sideboards which is nice wood to exhibit. Can’t tuck in comforters as I have foam mattress and it’s a tight fit. Negative part- the whole inner workings of bed were for another model- the montauk. By time handyman and I figured that out it was couple hours. Called overstock, they were helpful and then sent correct parts and said trash the others. Not a super quality product, I guess then?? New sideboards arrived, the headboard and footboard were correct from beginning . However from description of bed as advertised I thought I was getting solid wood but new sideboard has veneer coming out in a small area (see photos). Basically just a pine bed. I kept bed mostly because I like the look of bed. Overstock should definitely have more qc before shipping out. Would definitely recommend. Came in 3 separate boxes.Head board in one box, rails and slates in another. Foot panel in another. Real wood, easy to assemble. Took myself less than 1 hour. Bought 8 in. foam mattress. Fits perfect and 8 inches high enough to clear side rails. Sitting on mattress you do not hit the rails. I put furniture stick'em pads under the legs, so when I push the bed, while changing the sheets its extra protection against the hardwood floors. I am generally happy with the bed. It seems very solid once assembled and the design and color (acacia-natural) are nice. I took off a star because there was a pretty good 2.5 x 0.5 inch dent in the top of the headboard (corresponding to a divot in the packing box) despite how carefully it was packaged. I can't be bothered to send it back for replacement and it isn't terribly noticeable from the side. Also there is no question that you need to predrill all the holes. You might then have a chance at hand driving all the screws (which is what the instructions recommend) but you would be crazy to do that and you WILL hurt your wrist. 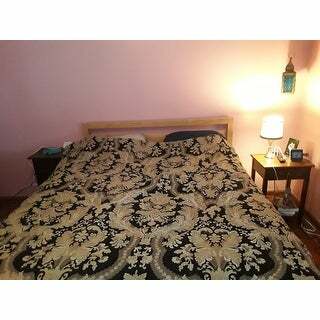 Love love this bed. It is simple and well made. Wish we would have two of them! 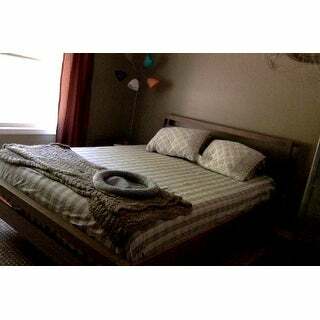 But in another review I was pretty happy with the bed we bought as well. This is a platform bed so you don't need a box spring.... bonus. This bed is solid! I have a thick, 11 inch high memory foam type mattress on the slats and it makes the mattress firmer than if used with a box spring. It did take me a bit of time to put together, but easy instructions. I love it! P.S. Our cat, Minerva loves it too! Sturdy, a good height with our 10 inch "Bed in the Box" mattress. We put in a guest bedroom where it looks lovely with one night stand, which we purchased that matches. We got the pine color and it is true to description and picture. We are quite pleased! Bed went together smooth. Because it's pine I opted to add additional precautions by gluing certain joints during assembly but not needed. Once assembled bed is solid. We have been sleeping on it for 3 weeks now and no creaking, not a sound and seems sturdy. Finish is beautiful! Never knew pine could look this pretty! The bed arrived in 3 large boxes, and was extensively padded, so there was no damage. It was easy to assemble using a cordless screwdriver, and is really solid! Looks great! When I ordered this bed frame set I was somewhat skeptical as to what it would look like when I put it all together... I am pleased to say that this set looks much nicer than what you see in the picture and I think you will be very happy with it... I'm a short chubby guy about 210 lb and this bed does not squeak or move on me... I love it!!!! It has a short headboard which is what I needed for my small room... You will not waste your money on this bed.!!!!!!! The quality was mediocre but the reason I am rating this so low is because it smelled like mold or mildew. we put the bed together and figured that by wiping the surface the smell would go away. I tried wiping it down with Murphy's Oil Soap, straight bleach, and some other product. I ran a dehumidifier in the room. Nothing worked. Overstock offered to let me return it but at this point that just seems like more work. *** . I bought this bed for my teenage daughter. It took awhile to put together with 2 people. The screws in the center brace were hard to turn in. We decided to use a bar of soap and coat the screw before screwing into the wood. That made all of the difference. The bed looks great and my daughter loves it. The color is gorgeous! We've had the bed for a few months now, and my only complaint is that I'm not sure how long it will last. I'm only 120 pounds and my boyfriend is only about 180 and there have already been a few times one of us went to sit on the bed or lay down and there's been some creaking/cracking noises. I'm pretty sure it's just the bed slats, but I worry about them holding up in the long term. We bought 2 of these bedframes for our cabin. The build quality of the beds is superior and they don't squeak at all. The setup instructions were easy to understand and follow. When we read reviews on these beds, there were a few references to the bed smelling a bit weird. We didn't experience any of those issues and absolutely love them. Pretty bed and very sturdy and solid. A bit challenging to put together as there are several long screws and I did not use a drill. Directions are easy to follow. Very simple yet sturdy and beautiful furniture. Gorgeous sturdy and heavy wood frame. It really is quite solid, and the white color looks beautiful, you can pick your linens to contrast or to match. There is good storage space underneath. Would definitely recommend. Bed came in well packaged. Hardware was nicely separated and labeled which made assembly easy. The only assembly issue was the missing drilled holes for the mattress middle support beam. An easy remedy. The bed itself is nicer than expected. We chose it for the beachy feel and the lower headboard height to accommodate our lower height from slanted ceilings. Great purchase! Bed is built very well, very pleased with how easily it went together. Only took about 1.5 hours to put together. Solid bed for the price. Can’t beat it. Would 100 percent recommend purchasing this bed. I’m glad I did! Everything arrived undamaged and quicker tha expected. The frame is the perfect size for the room and looks good too. Assembly was easy, and feels solid. I don't like that some of the unfinished/bare surface pieces of the center support are visible from some angles, but aside from that I'm satisfied. It looks great. And feels pretty sturdy. I think it's great quality for the price and I'm hopeful it will last a long time in our guest bedroom. As some other reviewers have noted, most of the holes weren't pre-drilled for assembly so it did take a bit of work putting it together. But the directions were pretty easy to follow. "What is the total weight capacity for this bed"
"What exactly does "brushed white" mean? Is it a bright white? What does "brushed" mean?" "Will the Weathered Pine option ever be back in stock for the King size bed?" At this point we only carry this bed in queen size, no plans for having king size. "What are the dimensions of the legs in inches? (LxW)"
"Is there room for under the bed storage boxes? We live in a tight city apartment, need under the bed storage." The clearance under the bed rails is approximately 8 inches high, so it will fit storage boxes. "What is the height at the foot of the bed from floor to the top of the wood? (Essentially, what is the height if you DON'T account for the headboard)?" "I need to know how high the headboard is, from floor to the top of the headboard please."